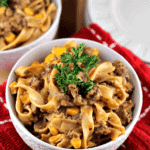 Taco Stroganoff ~ Add a kick to your favorite stroganoff loaded with Corn, Taco Meat and Pasta! Cook onions and ground beef until beef is browned. Drain fat. Add taco seasoning, water and corn to beef mixture in pan; cook 1-2 minutes. Add cream cheese and cheddar; cook until it is heated through and cheese has melted. Serve over noodles or toss with noodles.